For years I have exercised at least three times a week. It became my routine while I was working in a stressful job to go either to a class or the gym before or after work. Over the years I have purchased and worn many different variations of gym and active wear so when I approached by a brand I had never heard of I was curious. I have to admit that I am that person that has absolutely no problem at all when it comes to wearing my gym wear out in public! I will happily stroll around Sainsburys looking at lettuce or meet a friend for coffee! To me it is now acceptable especially with such amazingly flattering styles out there for us to wear.. So why are they different? When the pieces I had chosen (linked below) arrived I was immediately taken with how everything felt! Just slightly different, more soft with the most amazing quality feel. My research had already told me that all of the collections by Asquith were made using bamboo and organic cotton. This creates the feel and as well as being better for the environment allows our skin to breathe naturally much more than lycra so is perfect for multifunctional use. The fabric also will not fade or bobble like some lycra mixes. Made from 60% bamboo these leggings are a bestseller. For me these are my go to gym wear choice. Great for pilates, running and classes. I have found them both comfortable and airy!! You know that clingy sweating feeling, well that just didn’t happen…. Again a great shape with a fitted medium support bra. These yoga pants are just gorgeous! The most beautifully flattering shape with deep leg cuffs that stay in place. If you are a yoga fan you will know how great this is! 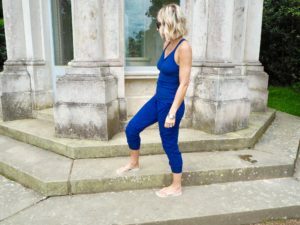 I have loved wearing all of of my choices and I have to say that for me good quality, comfortable and flattering gym and activewear is motivating. Gone are the days when we just throw on an old grey T shirt and leggings and hide in the car until the last minute before our class! I have been super impressed with both the quality, style and fit and really just the range that Asquith has to offer. I am about to ramp up my exercise routine for that all important summer bikini body so will be rocking my new pieces for sure….watch this space! Previous Post You only have to think about one thing!….